Wherever you live, you can embrace design strategies to further manage the sun’s heat loads on the structure. As we mentioned in Chapter 1, in the northern hemisphere the sun is always either in the southern sky or directly overhead. In North America, the sun rises at due east on the spring equinox, April 21, and fall equinox, September 21, and sets at due west on the same dates. On June 21, the summer solstice (the longest day of the year), the sun crosses at its highest path across the sky overhead, rising and setting well north of due east and west. 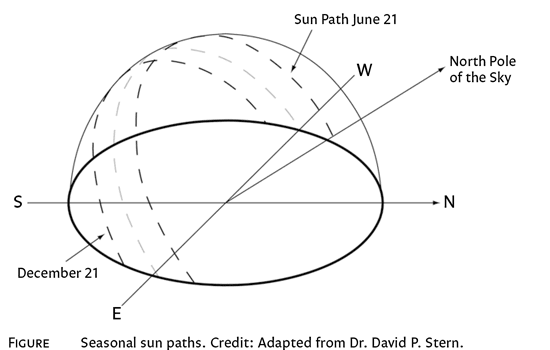 Each day a er June 21, the sun’s path starts and ends further toward the south of due east and west and lower toward the southern horizon until it reaches its lowest path across the sky on December 21, the winter solstice (the shortest day of the year), and then the process reverses. Knowing the seasonal sun path across your site allows you to design to manage solar heat loads to your benefit. Take time to research your location’s latitude. e closer you are to the equator (like in the southern US), the more days you will need air conditioning rather than heating. You want to minimize the amount of solar heat gain on the structure, so, as mentioned in Chapter 1, you want the short walls of the house to face east and west; since these two walls have the least amount of wall area, they will absorb the least amount of solar heat into the home. Interestingly enough, if you live in a predominantly cold climate area like the north (with more days needing heating than air conditioning), you should still design your home with the long walls of the rectangle running east and west. Regardless of your latitude, you want the south-facing windows to be completely shaded at noon on June 21 and completely un- shaded at noon on December 21. e key here is the design of the overhangs. In this case they must keep the sun o the glass when the sun is high in summer and let it in when the sun is low on cold winter days. at means that we design to control the amount of heat gain through the south wall and windows. We can use ex- tended roof overhangs, covered porches and other shading devices (like awnings) to shield windows and walls on the south side of the house from the hot summer sun. is improves the cooling effects of passive ventilation strategies in the summer. These same windows on the south side of the home can provide passive heating of the living space when the sun’s path is lower in the sky in the winter. e result is that overhangs help to lower our mechanical heating and cooling costs. As you can see in the drawing above, the lower the sun is in the sky and the shorter the overhang length, the further the sun penetrates into the house. e farther north you are, the lower the sun’s path across the sky, and the farther south you are, the higher in the sky it moves. is fact will affect the length of your overhangs and how you build to take advantage of or avoid solar heat gain in you home. All three of these things—length of the overhang, height of the overhang above the window, the angle of the sun in the sky— impact how much solar heat gain you will reap (or keep out, as the need may be).